The huge influence of William Shakespeare around the world is clear to see when you talk to some of the proud Stratfordians joining this year’s 400th Anniversary celebrations from across the globe. They will be in town for the ‘Stratfords of the World UK Reunion 2016’ and the highlight of their busy programme will be representing their countries at the Flag Unfurling Ceremony, as Shakespeare’s 452nd Birthday Parade reaches its climax on 23rd Abril 2016. Every other year, six Stratfords from around the globe gather for a reunion and celebration of both their shared culture and unique qualities. Stratfordians from Connecticut USA and Ontario Canada set up a ‘sister cities’ programme of cultural and social events in 1985, shortly afterwards joined by their inspirational namesake from Warwickshire, then towns from Prince Edward Island, Canadá, Australia and New Zealand expanded the group in the late 1990s. 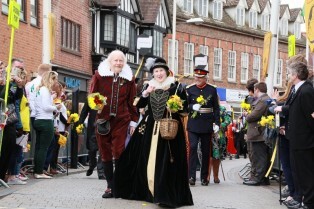 Este ano, a partir de 20 - 26 Abril, Stratford-upon Avon will host around 140 guests for the special 400th Anniversary festivities including the Shakespeare Birthday Parade, in a week long programme of events, trips and warm Warwickshire hospitality. Such has been the enthusiasm for the 2016 event that two receptions will be necessary to welcome everyone. Breakfast or Afternoon Tea at the Town Hall will kick off the proceedings on Thursday 21 Abril. “Our common bond through Shakespeare and music brought us together initially; the program’s legacy is enduring friendships. Since first joining in 1993, I have hosted and/or been hosted by Stratfordians from Canada, Nova Zelândia, Austrália, and England. Ours is truly a global neighborhood. Not all hosting is done during large reunions; sometimes folks are just passing through our town and need lodging for a night or two. Lovely and so very Stratford!" a unique ‘Mask Moment’ for this year’s commemoration of 400 years since Shakespeare’s death when spectators will be invited to don a Shakespeare Face Mask, commissioned especially for the 2016 Celebrações.